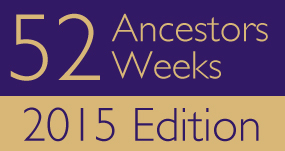 52 Ancestors: # 17 ~ Johann Leonhardt MAY ~ …and Prosper. My 6th great-grandfather, Johann Leonhardt May was born 17 January 1719 in Niederhausen, Rheinland-Pfalz, Germany to Johann Nickel Mey and Maria Catharina Graeff. Before arriving at Philadelphia in September of 1748 on the ship Edinburgh, Johann Leonhardt May had lost to death his father, his wife, and two children. Leonard’s father, Johan Nickel Mey, had died in Niederhausen on 21 February 1743. Leonard’s first-born son, Johann Conradt, died in 1747, followed by the deaths of his wife, Maria Barbara Lorentz, and his recently born daughter, Anna Otilia. 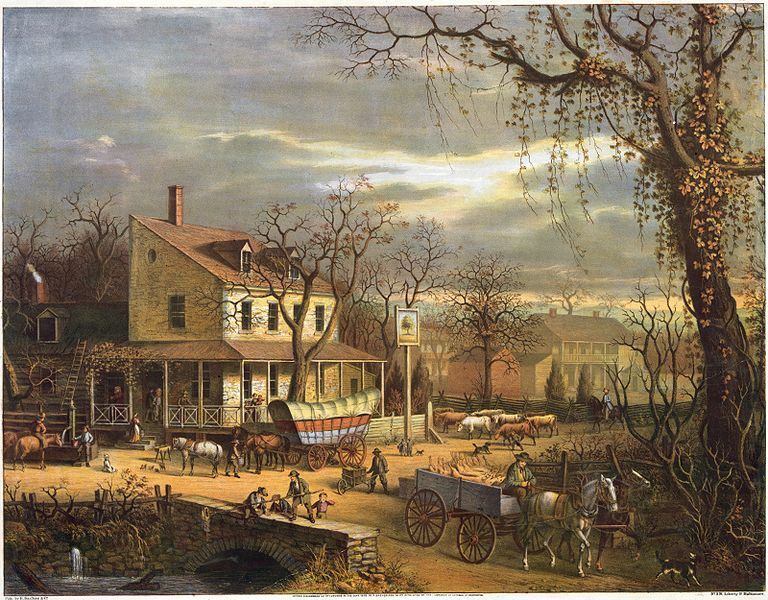 Soon after they had arrived in Philadelphia, the extended May family made their way to Lancaster County, Pennsylvania. There is little doubt that they traveled by way of the King’s Road, better known as the King’s Highway; otherwise known as the Old Philadelphia Pike, and now, known as State Route 340. 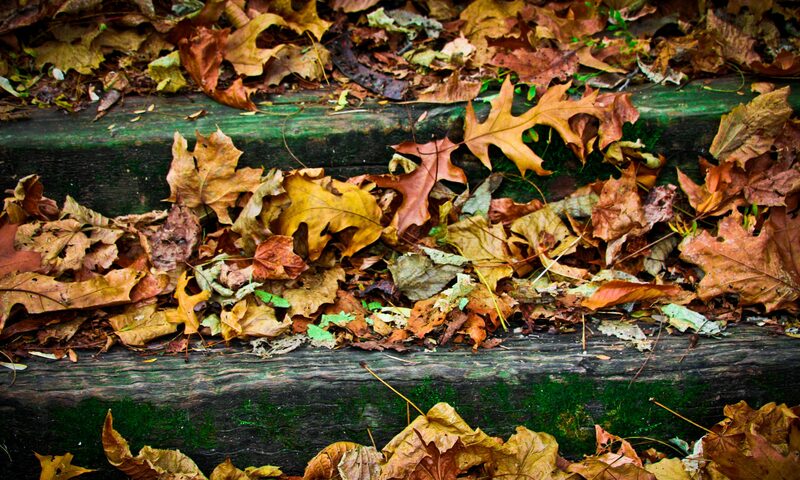 The King’s Highway began approximately in 1733 as part of an old Allegheny Indian path and was more like a dirt wagon trail than anything else, but by 1748 when the May family arrived, this was very rapidly becoming the most widely traveled wagon road in the colonies. I happen to be a firm believer that simply by being in the right place, at the right time, can make all of the difference…timing is everything. This was about 60 miles of road that took travelers from Philadelphia to Lancaster County, ending at Wright’s Ferry on the Susquehanna River, which was, at that time, the westernmost edge of the frontier and required a couple of days (at best) of travel. Whether Leonard and his brother, Daniel, had a plan before they arrived in Pennsylvania, or if it was just a matter of sizing up the opportunities available to them, they quickly set about buying land and establishing businesses. What did the growing population of Pennsylvania need? Ways to get places and to transport goods. What else did they need? Places to stay and to eat while travelling. It is little wonder then that Leonard became a waggoner and that both he and Daniel invested in real estate and the buying and selling of land. Youngest brother, Francis, was also a landowner and had apparently continued on in the occupation of his father as a shoemaker. Tax records show that Daniel was a tavern keeper and an innkeeper and that Leonard was also a tavern keeper at some point. Although I have not yet found the marriage record of Leonard May and Anna Christina Schuch, it would appear that they were married sometime in 1749 and probably in Lancaster County, although perhaps in Philadelphia. I have been searching in both places. 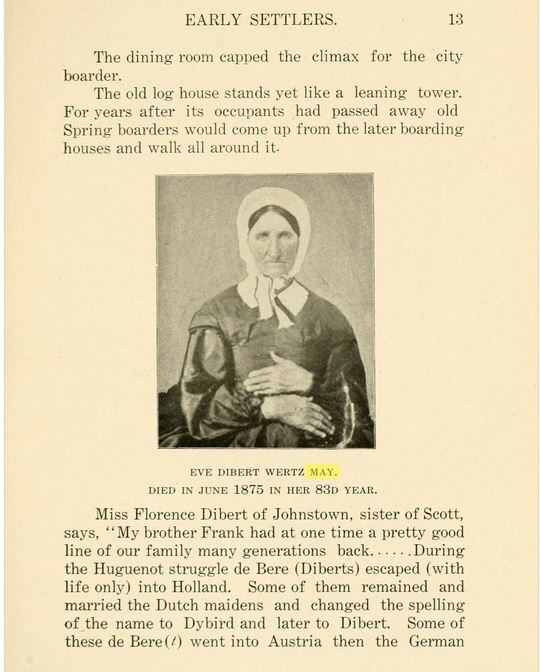 Their first child, Anna Maria, was born 21 January 1750 in Donegal Township, Lancaster County. Followed by Margaretta, Frantz Peter, Johannes, Johann Daniel (my line, born 27 September 1756), Elizabeth, Johann George, and Michael, born about 1766. Note. My son, William Franklin, is empowered to enter into like contracts with any person in Cumberland county. It is not known for sure whether Leonard was a waggoner before this call for wagons went out or if he seized upon this opportunity to make money. 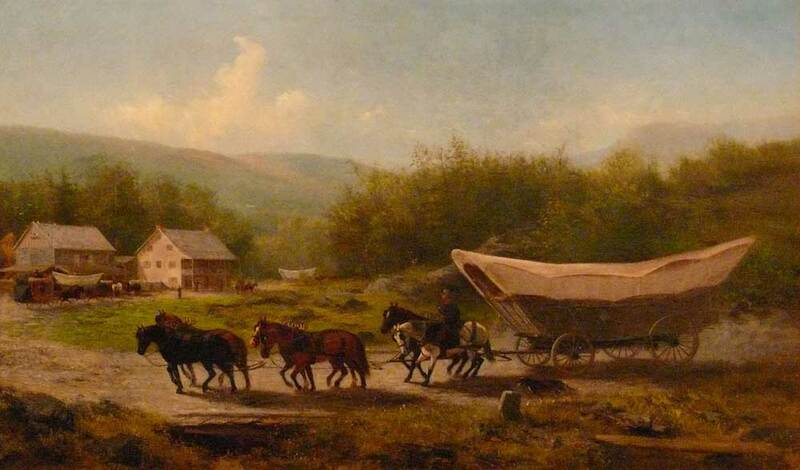 Although many wagons were probably in use by farmers and waggoners during this period of time, none were as utilitarian as the Conestoga wagon which was developed by German wagon makers in the Conestoga Valley of Lancaster County before the French and Indian War started. The box part of the wagon was made with upward sloping floors and an unusual shape in order to prevent shifting of the cargo over hills and rutted roads. The wagons were pulled by a team of six horses – huge, powerful, and usually, black – that were also bred in Lancaster County. The driver usually walked beside his team, but occasionally, would ride on the “lazy-board” which could be pulled out on the left side of the wagon. Somewhere around 1768, Leonard May’s family and those families of his two brothers packed up and moved to Loudoun County, Virginia. Leonard and family appear to have owned land and lived around Waterford, Virginia. Leonard and his sons were involved with the road-building in that area. Their names appearing in Loudoun County road order reports. Then sometime between May of 1775 and May of 1777, Leonard passed away. 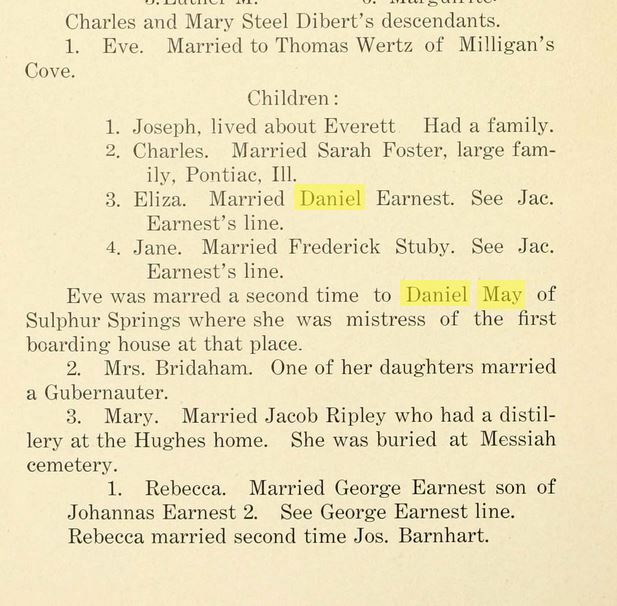 His brother, Daniel, died in 1777 and it appears that he and his wife were childless. In his will, he left his estate to his namesake and god-son, Leonard’s son, Johann Daniel, who was born in 1756 in Lancaster. (Again, this is my line of descent.) 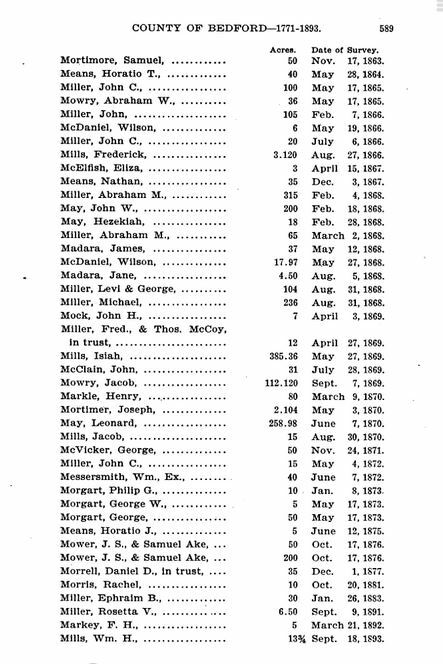 It appears as if Leonard May had purchased land in Bedford County, Pennsylvania before his death and that he was perhaps planning on making the move there from Virginia as his name (and other family member’s names) appears on a list of land warrants issued. 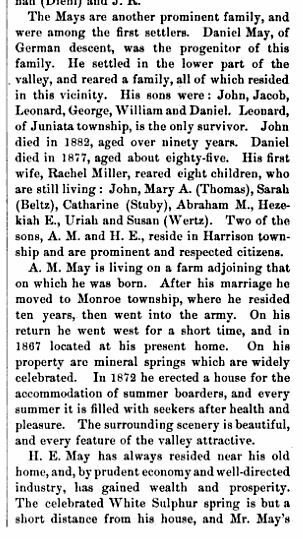 Daniel married Elizabeth Dorcheimer and had moved to Bedford County, Pennsylvania where they had at least six children, including their son, Daniel, born in January of 1794. 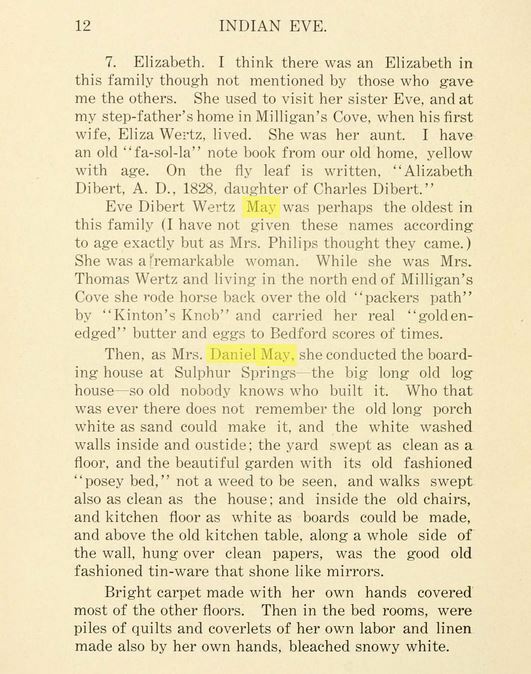 Daniel, grandson of Leonard, appears to have kept up the family propensity for being innkeepers. This was a good family story to learn about. Once again, I am forever in debt to those who did such well-documented research in the past. The optional theme for this week was “And Prosper”. 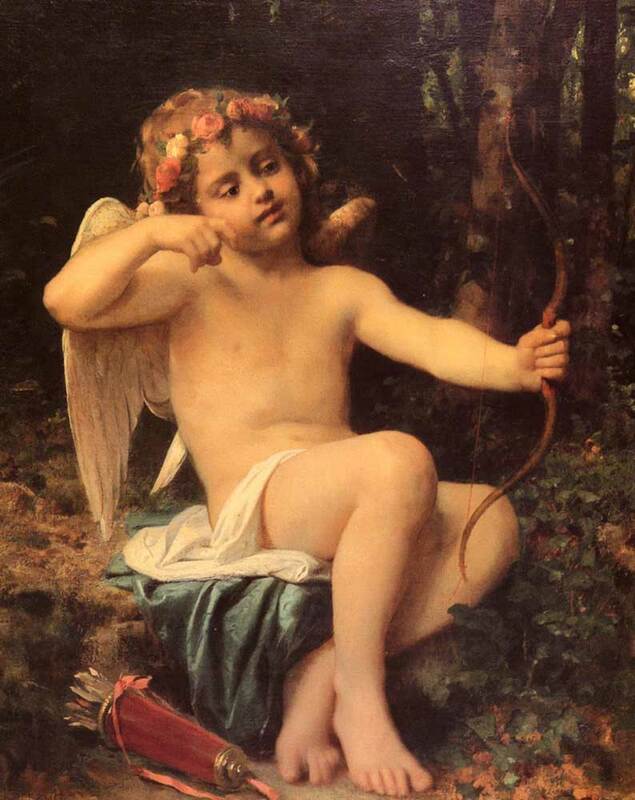 I’d like to imagine that there are some truly romantic love stories out there among my ancestors, especially since today is Valentine’s Day, but there really are none that I am privy to. Not that we observe this particular “holiday” here in this house… It was kind of fun when my kids were very young, or when I was much younger than I am now, but these days it is mostly a non-event. We are spending this windy, snowy, wintery day by laying around and reading and then ordering in pizza for dinner. That’s pretty much a perfect day! Perhaps I’ll bake some heart-shaped cookies later to warm up the kitchen. Anyway, as usual, I digress. After looking over those distant relatives with surnames of Love, and Valentine, and Hart in an attempt to find something that would resonate with Amy Johnson Crow’s suggested optional theme for the 52 Ancestors 52 Weeks Challenge for this week and not feeling inspired, I started searching for a couple who might have been married around the 14th of February. I found that I have exactly one. Admittedly, I have not spent as much time on my dad’s ancestral line because gathering the information has been such a chore. My dad’s father died when he was three years old and no one really knows too much about that family and then, add to that, the fact that my dad’s father was born with the surname Otto, but for some unknown reason started going by the name of Schrader as a young adult. I know! Like I said, it’s mostly a chore. No one seems to have much information on my grandmother’s family either, so it has been like starting with a blank piece of paper…literally. There is an interesting branch of my father’s line, though, the Mey family (and if I could figure out how to type an umlaut on this laptop, I would do so). Johann Nickel Mey is my paternal 7th great grandfather. He was born on 29 May 1673 in Alsenz, Rheinland-Pfalz, Germany to Johannes Mey, a judge from Callbach and Margaretha Lauers from Niedermoschel. Johann Nickel was a shoemaker and married Anna Catharina Beyer on 18 April 1699 in Niederhausen. Two sons were born to the couple over the next few years and it appears that Anna Catharina died in childbirth in 1707 at the young age of 26. Both sons died in infancy. On 14 February 1708, Johann Nickel married again. 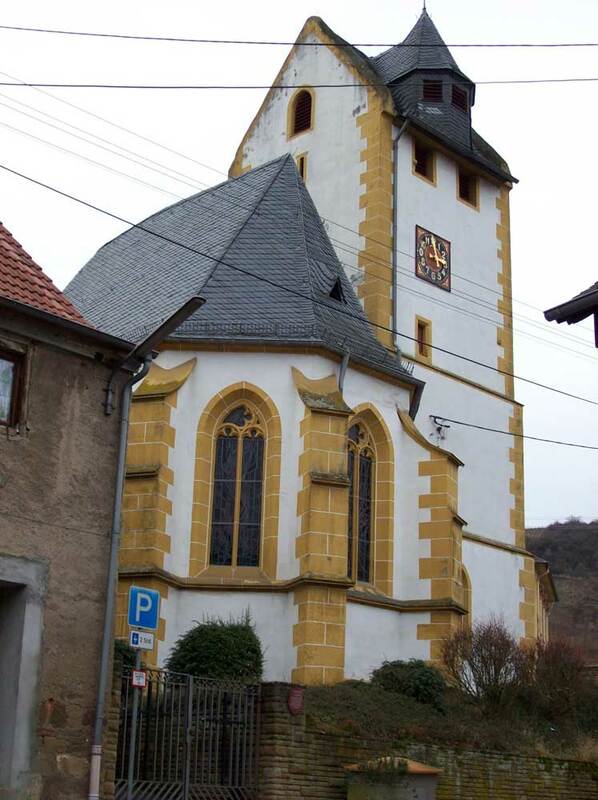 This time to Maria Catharina Graeff, the daughter of Anna Margaretha and Johann Nicolas Graeff in the Niederhausen Reformed Church. According to essays written by Fred T. Mays on the mayhouse.org website, this day was also a special day in the village because St. Valentine was the protecting saint of the congregation. This marriage then, is my romantic story for today. Johann Nickel and Maria Catharina would go on to have seven sons and three daughters and although two of the boys would die as infants, the rest all grew to adulthood and married. During this time, Johann Nickel became a judge as well. On 21 February 1743, Johann Nickel succumbed to an illness and passed away. At some point after his death, the family began making plans to move to America. The years following The Thirty Years War in Germany were followed by many years of religious persecutions and other upheavals. 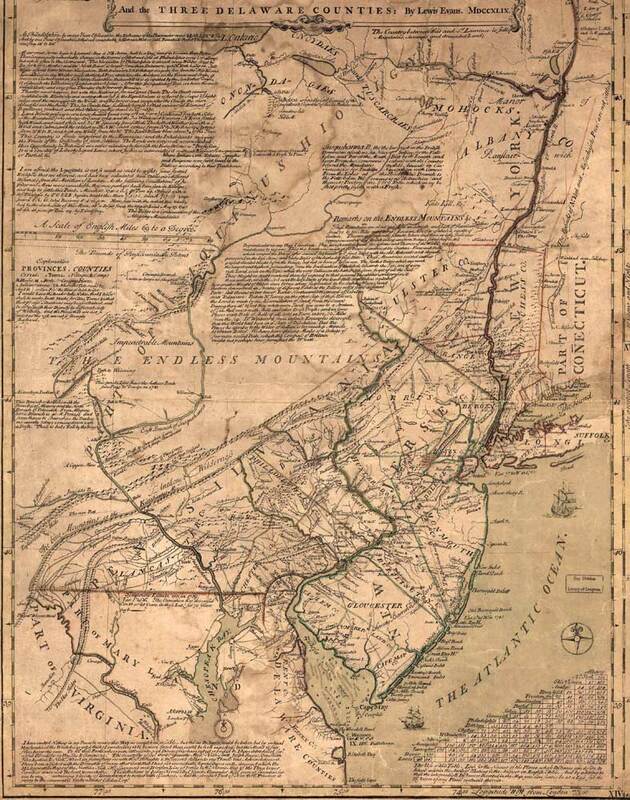 This resulted in more than thirty thousand immigrants flooding into Pennsylvania just prior to the Revolutionary War during the years 1727 through 1776. During the summer of 1748, Maria Catharina said goodbye to her husband, long buried, and two of her children who were staying behind, to travel up the Rhine to Rotterdam on the North Sea. There she boarded the ship Edinburgh along with three sons and two daughters, bound for a new life. They arrived at the port of Philadelphia on 05 September 1748. “Deutschland, Heiraten, 1558-1929,” index, FamilySearch (https://familysearch.org/pal:/MM9.1.1/NZ6K-13L : accessed 14 February 2015), Johannes Mey in entry for Johann Nickel Mey and Anna Catharina Beyer, 18 Apr 1699; citing Alsenz, Bayern, Germany; FHL microfilm 193,751. Egge, Marion F. Pennsylvania German Roots across the Ocean. Philadelphia, PA: Genealogical Society of Pennsylvania, 2000. Print. Eshleman, H. Frank. Historic Background and Annals of the Swiss and German Pioneer Settlers of Southeastern Pennsylvania, and of Their Remote Ancestors, from the Middle of the Dark Ages, down to the Time of the Revolutionary War; an Authentic History .. Baltimore: Genealogical Pub., 1969. Print. Jordan, John W. N.p. : n.p., n.d. Print. Rupp, I. Daniel. General Remarks on the Origin of Surnames Interpretation of Baptismal Names, Which Occur in the Collection of Thirty Thousand Names of German, Swiss and Other Immigrants ; to Which Are Added Other Baptismal Names, Both of Males and Females. Harrisburg: T.F. Scheffer, Printer, 1856. Print. STRASSBURGER, RALPH BEAVER. 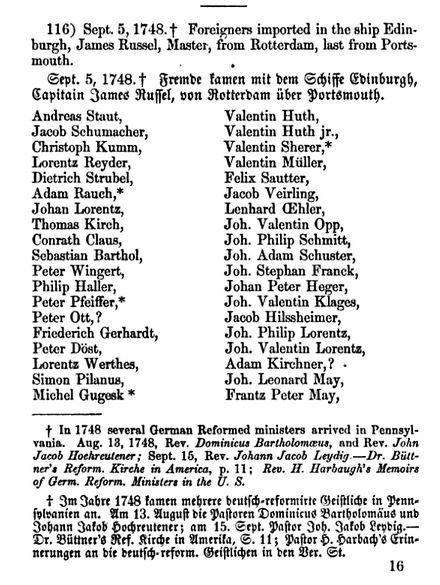 Pennsylvania German Pioneers: A Publication of the Original Lists of Arrivals in the Port of Philadelphia from 1727 to 1808. Edited by William John Hinke. Norristown [PA]: Pennsylvania German Society, 1934. 3 vols. Vols. 1 and 3 reprinted by Genealogical Publishing Co., Baltimore, 1964. Repr. 1983. Vol. 1. 1727-1775. 776p.